Click on the images above to view full size. 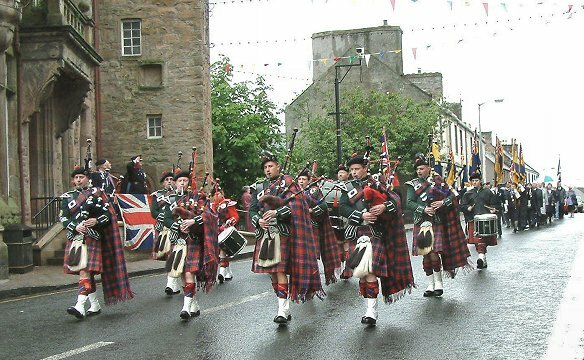 Despite bad weather, Maybole's commemoration of the 50th anniversary of the coronation of the Queen went ahead on Sunday. 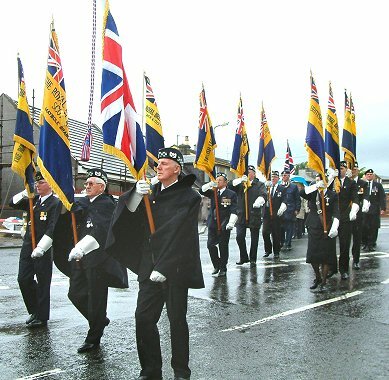 The event was organised by the local branch of the Royal British Legion Scotland and Maybole Pipe Band led a parade from the Greenside to the West church where a very special service was taken by Rev. Dave Whiteman. In his sermon he said, "The queen has given four symbols to the nation for our consideration and reflection - the bible, oil of anointing, a bowl and towel, and a bell." Her majesty is, as you know, a very devout Christian and she takes the scriptures very seriously. Indeed in her broadcast at Christmas 2000 she said these words - 'for me the teaching of Christ and my personal accountability before God provide a framework in which I have tried to lead my life. I, like so many of you, have drawn great comfort in difficult times from Christ's word and example. I believe that the Christian message remains profoundly important to us as we go forth into the world in peace. And so be of great courage, hold fast that which is good, render to no man evil for evil, strengthen the faint hearted, support the weak, help the afflicted, honour all men. It is a simple message of compassion and yet as powerful as ever today 2,000 years after Christ death.'" In the next part of his sermon Rev. Whiteman said, "Our second symbol is the oil. At her coronation the queen was anointed with oil to bless and consecrate her for this holy office. The queen has given us this symbol as an example of dedication; dedication to our nation, dedication to our local communities, dedication to one another, and dedication to god. The oil reflects the queen's selfless dedication to duty." The third symbol was the bowl and towel and he continued, "Every Maundy Thursday the queen demonstrates the majesty of service by distributing money to the poor. Our lord Jesus Christ washed the disciple's feet and said 'you are to do as I have done'. This bowl and towel are symbols of service." "On her 21st birthday the young Princess Elizabeth spoke these words on the radio. 'There is a motto passed down by my ancestors, a noble motto "I serve". These words were an inspiration to many. Through the inventions of science, I can now make my solemn vow of dedication with the whole empire listening and so I declare before you all, that my whole life whether it be long or short shall be devoted to your service and the service of our great empire. I shall not, however, have the strength to carry out this resolution unless you join with me. I now invite you to do so; I know that your support will be unfailingly given. God help me to make my vow and God bless you all who are willing to share it.' The bowl and towel reflect the service of her majesty." "And finally," said Rev Whiteman, "the fourth symbol - the symbol of the bell. It is Her Majesty's wish that we celebrate the community life of our nation. I quote 'May this community life be a living fellowship of mutual trust, care, and compassion. In her Christmas 2001 broadcast Her Majesty spoke these words 'I believe that strong and open communities matter both in good times as well as bad; community provides a way of helping one another. I would like to pay tribute to so many of you who selflessly work for your neighbour. Communities provide help, but they also give us an important sense of belonging which is a compelling need in all of us. We all have times of great happiness and suffer times of profound sadness. Together happiness is heightened and sadness softened, when it is shared with friends. But community is more than helping one another, more than a sense of belonging. It also helps us share a common desire for a fair and ordered society; community helps us overcome differences and misunderstanding by reducing prejudice, ignorance, and fear. We all have something to learn from one another whether our faith be Christian, Jewish, Muslim, Hindu or Sikh. Whatever our background, whether we are from town or country, we can learn much from one another.'" Summing up Rev Whiteman said, "And so Her Majesty has given us these symbols: the bible, the symbol of wisdom in the scriptures, the most valuable thing the world affords; anointing oil, the symbol of concentration and dedication to duty; the bowl and towel, the symbols of service to others; and the bell, the symbol of community. Her Majesty has given us these symbols that we might think about them and reflect on them. May we all take the scriptures as our supreme rule of life, may we dedicate ourselves to God and to one another, may we put the service of others first, and may we live together in a community of love and mutual respect." 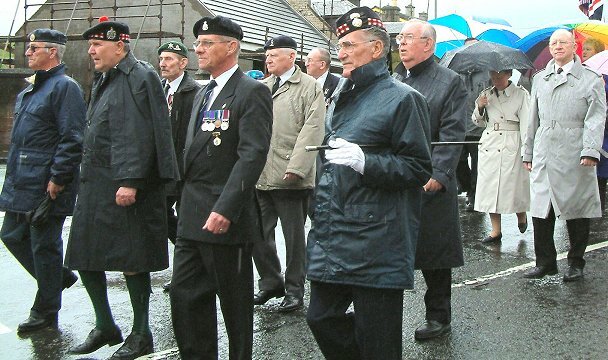 After the service there was a parade back via Whitehall to the Greenside and at the Town Hall Col. John Dalrymple-Hamilton took the salute as the parade marched past. 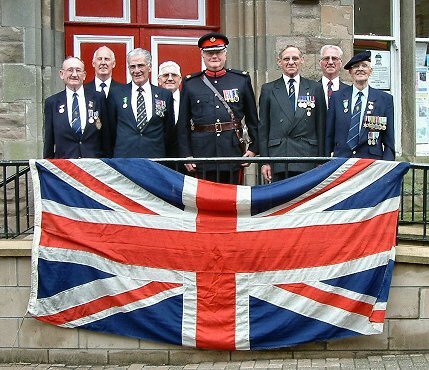 There was a civic reception afterwards in the Town Hall provided by South Ayrshire Council.